We use ICT in the class on a daily basis. From using the class computers, the interactive white board or the laptops we are always participating in individual or group activities around ICT. Here is a link to our favourite places that we use in ICT. This link will be updated on a continual basis with loads of new ICT sites. You will be able to find the Using ICT – Cooinda on my links list. Research about Bridges for you all. Room 10 is also most welcome to complete the project. The Team from Room 13 have been working very hard to get their personal blogs up and running. Each student has decided on a topic for their blog and have begun to create some very interesting posts. Most of them have managed to introduce a topic, write about camp and do a poem. Please make sure you check them out but remember that our blogs are windows into our learning experiences. Please help us celebrate all of our attempts – in draft or polished form. And please feel free to leave a comment for us to see that you have visited us. Well our Natural and Processed Materials science program is drawing to a close. We have been learning lots about atoms, matter, solids, liquids, gasses and properties of materials. This week the children were given spaghetti strands to trial and test how much stress they could put on it when joined together like beams of a bridge. They had to hang a polystyrene cup from the beams and fill it with as much water they could before it snapped. After the testing stage we are hoping the students can come up with some unique and amazing bridges. It has been an amazing and exhausting month for myself and my teaching comrade Gary Phipps from ‘In the Den in Room 10′. We started this whirlwind of a trip with the decision to start class and student blogs. Something that we have thrown ourselves into enthusiastically and completely with great success. All this the week before preparing for our school camp. Within this preparation we made bolognaise (the spelling of which we have debated about and agree it should just be Spag Bog as we are Aussie) with our class to take with us on our tour of Busselton. We then took off for camp with 66 year 6 and 7 students for a three day, activity filled trip. We played golf, did archery, went caving, got lost in a maze, took a train ride on the jetty, a historical walk and went under the ocean at an observatory. Although supported well by four wonderful parents and Gaz’s student teacher, Kendel we were both completely exhausted. Soldiering on, returning to school on the Monday with oodles of food left over from our well organised catering, we were presented with an idea by our dear friend, Di Toia (Yr 5/6 teacher) to prepare and have a long lunch. This lunch menu came complete with vegetable soup, ‘Spag Bog’ and pear tarts. A great day and enjoyed by all. Next Gary developed the idea to have a cooking challenge last week. The children were put into groups and developed a recipe that had to consist of ….. Weetbix. (Also leftover from camp) I was part of a group of four who would be the judges and taste testers. Thank goodness the students and I had built up a good relationship from camp otherwise I may have been concerned that my portions may have had arsenic in it. As well as all of the above we have been madly doing experiments, writing poetry, assessing science investigations and writing reports. Not to mention actually doing some teaching along the way. Such a busy 4 weeks that I am glad is starting to slow down as of now …. please. Anyway having said how exhausting it has been it has also been fun and exciting. I love that I am greatly supported by two fantastic teaching comrades (and friends) in the senior block who always make me smile and laugh. I thank you Gaz and Di and so does my ‘Team from Room 13’. Today ‘the Team’ had a great time conducting their colourful cabbage investigations. 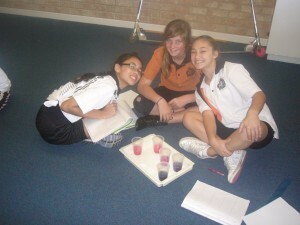 Yesterday afternoon they joined groups and wrote up the experiment where they posed questions and made predictions. Most groups wanted to see if the red cabbage solution that we made would act as a pH indicator and change colour when added to acids, bases or neutrals. 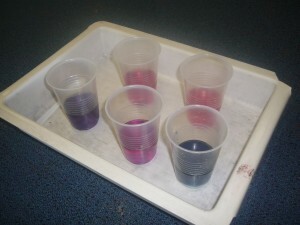 The students found that the solution worked well and had 5 cups of very colourful mixtures. Over the past few weeks we have been learning lots about narrative structure and audience, so we decided that it would be a great idea to write for a purpose. We thought that it would be nice to write a book for our pre-primary buddies from Mrs Woodward’s class. When the books are finished we are going to get the buddies to illustrate each page of the book. Last week the buddies came over to our class to do some activities with us. As we are only in the drafting and editing stage we got the them to illustrate the front cover of the book. They did a wonderful job and used a variety of different mediums to create amazing art work.